Apple growing is an ancient practice amongst human beings, and we are talking biblical old. And, pressing apples for juice is equally ancient. Primitive man figured out pretty quick that the apple tree was a good source of sustenance, an abundant source of sustenance, and the question became, how to preserve this abundance. Pretty much across the board, and across the apple growing world, the solution was to juice the fruit, ferment it, and create an alcoholic beverage with keeping power. Ancient man figured out how to make alcoholic or “hard” cider and he and she continues to do it in the apple producing parts of the world. And, in “hard” apple cider producing parts of the world, people delight in the fresh pressed apple cider as long as it lasts. But, this fresh pressed cider, or “sweet” cider is just a short lived treat on the way to the manufacture of “hard” apple cider. Its interesting to note that the United States is is the only country that really makes sweet cider for the sake of sweet cider. This unique product exists as a result of our unique history. Because the American focus was on making sweet cider, apples that made especially tasty sweet cider were developed and cultivated, and, the art and science of making sweet cider evolved. Sweet apple cider is an American tradition almost as old as the country itself. As soon as English colonists established themselves here, they planted apple trees, and in the fall, pressed the apples for their sweet and nutritious juice. Because the early colonists were abstinence minded puritans, the fresh juice was enjoyed fresh. They did not ferment it into hard apple cider. The puritans figured out ways to keep the apples fresh long into the season so they could keep pressing sweet cider well into the winter. Sweet cider became a staple in the early American fall and early winter diet. I don’t usually have anything nice to say about the Puritans, because, I think they were hateful people and their hateful legacy continues to drag America down. But, one good thing did come from their religious lunacy….they encouraged the production of sweet apple cider. As sweet apple cider is my favorite beverage of all time, I give a small nod of the hat to the otherwise mean spirited and hateful Puritans. Anyhow, as American History progressed, apple growing spread from New England to other parts of the country, and especially to locations ideally suited to apple production. Johnny Apple seed dropped apples all over the country but they really delivered the goods in some regions more than others. One such region stretches from Harrisburg, Pennsylvania all the way down to Roanoke, Virginia, on the east side of the Appalachian Mountains. Here the climate is just right for the production of apples, and, 100 years ago apple orchards could once be found up and down that piece of earth, almost in a continuous manner. Sadly, with development and recent changes in agriculture, there are fewer and fewer apple orchards in this zone, and now, one has to look to find an orchard, and even harder, a farmer who is keeping the tradition of sweet cider making alive. One such orchard is Ivy Hill Farm, located just south of Gettysburg and on the top end of this once apple producing region. Ivy Hills produces one of Maryland’s finest ciders. For six generations, the Martin Family have lived and worked this land, growing apples, and refining the art of cider making. The secret to Ivy Hill’s ciders delicious and complex flavor lies in the watchful eye and extensive knowledge of John Martin, proprietor and master cider maker. Mr. Martin inherited knowledge from his father, and has added to that knowledge over the many years he has been making cider. All this knowledge goes into the product, and you can taste it. Using hill top grown apples, the cider is pressed out in small, individual batches, of 200 gallons. Mr. Martin uses a combination of apples including one sweet variety, one semisweet variety, and one sour variety. One of the three apples must be aromatic in nature. The apples are tested for sugar content before they are pressed and the cider is blended artfully and results in an astonishing final product. It cannot be over emphasized enough to say that cider making is an art….and because America is one of the only country that makes it…..a truly American art. I have bought my cider from Ivy Hill Farm for many years… because it is the best cider in Maryland. I have tried them all, and being a sweet cider snob, I say with complete confidence, it is the best. I recently became interested in what went into making this incredible cider, and, asked Mr. Martin if he would show me how he did it. Very generously offered to show me the ins and outs of making cider. The secret of the delicious product I had enjoyed for so many years was about to be revealed! First, the apples are brought into the pressing house from the orchards. For each 200 gallon batch of apple cider pressed, one box of sweet apples, one box of semisweet apples, and one box of sour apples is used. One of these apples must be aromatic. The apples are then fed into a machine that first washes them in a mild bleach solution, then feeds them into a grinding machine. The grinding machine reduces the apples to an apple sauce like substance. The apple grinder then shoots the apple pulp to the press. Here you see the press trays being filled with ground up apples. Twelve trays like the one you see here being filled with apple pulp are stacked one upon the next. Here you see a close up of one of the trays being filled. The apples are ground up and loaded so quickly they dont have time to turn the characteristic brown color of a cut apple! Once the the cider maker has filled 12 trays, the trays are ready to be slide under the press. On the left you see a load of trays heading for the press, on the right you see twelve trays that have been pressed out. The press is a hydraulic device that applies uniform pressure to the trays. Here you see the “apple cider” running like rain water out of the press. At this point, its still clear juice. 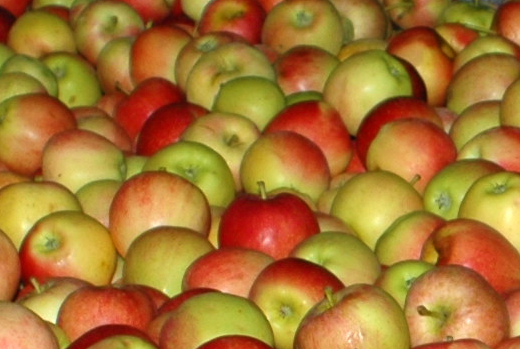 Apple cider develops its characteristic brown color within minutes of being pressed. It does not stay clear for very long. Here you see the trays after they have been pressed. The trays were five foot tall, and after pressing, they are about 18 inches tall. Everything that can be pressed from the ground apples has been pressed out. When the hydraulic press has done its magic, all that is left is a thin strip of dry apple pulp. According to Mr.Martin, this was traditionally fed to the cows or the pigs. The fresh pressed juice then gets piped from the press to a mixing tank. Here, the juice of the three apple varieties used, one sweet, one semi-sweet, and one sour, blended for the optimum flavor. As I said, I have drunk Martin apple cider for years, and have enjoyed every glass. But, having had the chance to really see how it gets made, several things became crystal clear to me. The first is that this is a really fresh, healthy drink. Its nothing but pressed orchard fresh apples, and nothing else. Its a fresh food and just has to be good for you. This is a super healthy beverage, filled with life, and, we all need to drink it whenever we can. The second is the amount of knowledge that goes into making each and every batch of apple cider. Mr.Martin observes each phase of the process, and knows what he is doing. He has that kind of knowledge that only comes from having done something a million times. The knowledge that goes into cider making is not something you can pick up from a book its something you learn how to do over time. And, over generations. The magical apple cider I have enjoyed for so many years does not magically appear. The cider maker first tends and maintains apple orchards to produce high quality apples for cider making. Then, when the time is right, apples are harvested. Then, the cider maker selects the right combination of apples to put into the press. And, once pressed, the cider is blended to result in a delicious cider. A lot goes into making apple cider, and, a lot more than I ever imagined. The last thing I learned from this field trip was this. If we don’t start supporting cider makers like the Martin’s, they will stop making cider. This century old tradition is just going to disappear. The cider maker has to make a living and unless we take the time to go out to his or her orchard, and buy the fresh made cider, the cider presses will stop pressing. So, I encourage everyone to do their part, and get out to the apple orchard nearest you, and buy a whole lot of apple cider. First of all, its delicious so its not exactly a painful activity, but, you will be doing your part to keep this American tradition alive.